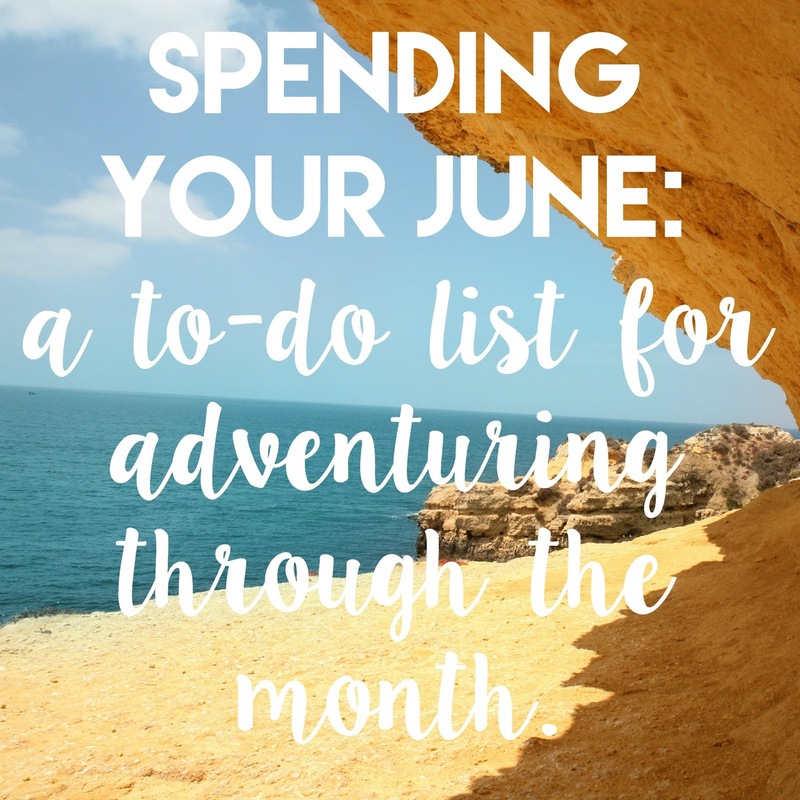 Spending Your June: A To-Do List for Adventuring Through This Month. | The girl who loved to write about life. Spending Your June: A To-Do List for Adventuring Through This Month. 1. Plan a staycation. Explore your own city-vacation without paying for a hotel! 2. Take advantage of how cheap fruit is during the summer months. Eat berries and cherries and melon galore. 3. Look up flea markets/drive-ins/farmer's markets that may only be open in the summer. 4. Make a list of all you hope to do this summer. If it feels like you won't have enough time, consider giving some things up for a little while...like Facebook. 7. Pick a town in your state that you've never been to and spend the day there. 8. Take a comedy break and watch an SNL short. I highly recommend looking up the Shy Ronnie skits. 9. Make plans to see out of town friends or family before the fall. 10. Learn a card game you've never played before. 11. Work on your homemade ice cream skills. 12. Learn one thing about each person who has announced they want to run for president. Look instantly smarter in conversations. 13. DIY a backyard game. Giant Jenga or tic-tac-toe! 14. Get new books from the library and spend the day reading. 15. Spend an entire day at the pool. 16. Make a Bachelorette bracket. It can hang on your refrigerator in shame. 17. Set up a little reading/writing nook in your house. 18. Experiment with iced tea recipes. 20. Download the GIF keyboard to your phone. And all of your text responses will win, forever. 21. Have a dinner party where you see how many versions of mac and cheese you can make. And by dinner party, I mean cook yourself dinner. 22. Go swimming at night. 23. It's hot outside...go without all the makeup for a day here and there. Or all summer, because you can. 24. Order a Ban.do planner. So you don't have regrets when they're all sold out in August. 25. Plan a cookout. Or several. 26. Make your 4th of July plans. 28. Send someone a thank you card. 29. Invest in a popsicle mold. 30. Throw a Hawaiian luau-themed dinner party. With these. And these. And definitely this. What's on your to-do list for this month? love this! makes me so happy for the summer months and fun in the sun! I need to find out more about this GIF keyboard haha! Cinnamon ice cream is on my July to do list! Does that count? I'm trying to cut a lot of crap out before vacation at the end of the month but July it's on. I LOVE farmer's markets...so many great ideas! YAY Summer! Yes! We are doing a drive in movie theater this month, and plan on lots of s'mores, days at the beach, and no makeup. Great list! Oh my goodness I love the idea of a luau themed dinner party, that is so so cute! I also eat fruit non stop in the summer...it's so refreshing and inexpensive I don't want anything else. Thank you so much for featuring my challenge, you are so wonderful and thoughtful! xxoo! I love this list! I need to download the GIF keyboard like now! Thank you so much for featuring J'adore June!! I am always up for a staycation. I made a new reading nook and i love sitting and reading all day. Best way to spend a day. Farmer's markets! I love those! Strawberries for dayssss. Eating a container of strawberries now and dreaming about a full day poolside! Unfortunately it's not quite June warm yet here in Illinois but we're getting there!! I want to do ALL of these things, thanks for the list! P.S. Thanks so much for entering the Summer Fun Giveaway, a chance to win $170. Good luck! Just wanted to let you know that after reading this I 'invested in a popsicle mold'! Also yummy juice. It's currently in the process of freezing. It's been YEARS since I made popsicles! Thanks for the fun 'to do' ideas this month!